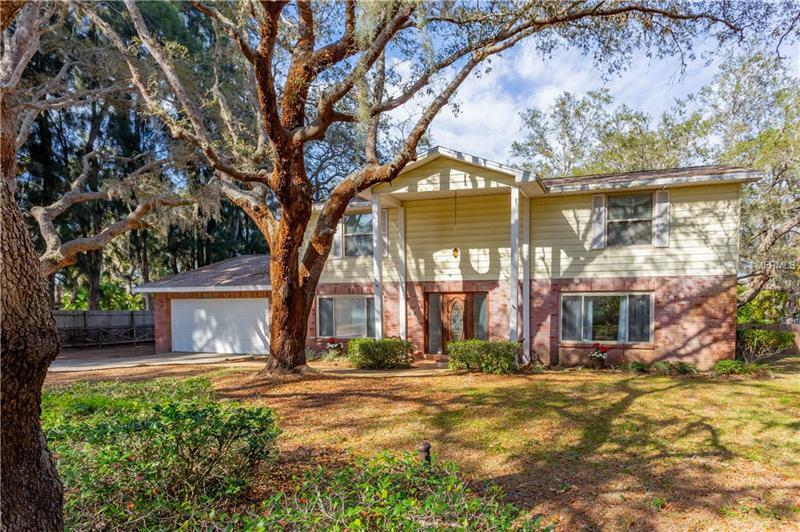 Located on a quiet and private Cul-de-sac, here is a unique opportunity to live in or rent a 4 bedroom, 3 bath home nestled on nearly 1 acre of preserve style lot. The current owner has maximized use of this home, it is currently permitted and being used as a 7-day rental that generates income. If you prefer, this is the ideal family home. The open floor plan is perfect for entertaining with plenty of room to roam between the eat-in-kitchen and family room with wood-burning fireplace. The family room is enhanced as it opens to a screened lanai that extends outdoor living to the pool area and large yard. The master suite is on the second floor along with two additional bedrooms that offer space for the entire family. For family and friends, the guest suite is located on the first floor. Transition outside where privacy abounds with the tropical surroundings prominent throughout the exterior. The yard is fully fenced so bring your family pet. This home is even zoned for one horse. Here you are just a few short miles to world-famous beaches. For the golf enthusiast, simply walk to the Largo Golf Course. Kids will love the Southwest recreation center that is less than 1/2 mile away. There, they can enjoy the pool, tennis and fitness programs with their friends. Designed for both comfortable living and entertaining, this exceptionally generous home is perfect for a large family or intelligent investor.